Where Would I Be Without Them? First poetry live tweet from my new home, first new book by Mary Ann McFadden in waaaayyy too many years. Follow along as I dive in! 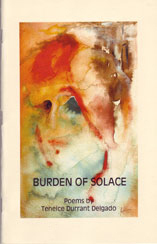 I came across a poem from this 1997 Milkweed Editions book last month and decided to get a copy. Bees and honey poems are always worth a second look here at This Frenzy. Since it is cold and dark here in Philly on March 1st, with another snow storm headed our way, it seems like a perfect night to read some poetry. I’ll be tweeting favorite lines as I read, and will work on a summary after. into the water, the second consonant vibrating, a ripple. silent, soft, sliding off into breath. Next up at #poetrylive, Rachel McKibbens! Today I get to start reading Rachel McKibben’s new book Into the Dark & Emptying Field. I first heard her read at Split This Rock in 2012 and was so moved and unsettled and astonished that I dreamt her poems for weeks. Follow my twitter feed to read along with me! I have strived to make this chapbook as historically accurate as possible. There is not much information on the Irish Slave trade, but I found Testimony of an Irish Slave Girl by Kate McCafferty and To Hell, or Barbados: the ethnic cleansing of Ireland by Sean O’Callaghan to be particularly insightful. I’m also grateful to Dr. Natalie Zacek for meeting with me after a random email and an even more random trip to Manchester, U.K.
of plantation air. For that, I said, Aimean, forbidden. The word “forbidden” echos through these poems, as a liturgy, as the rosary beads (forbidden) that another enslaved woman tried to pray when her child was taken away: “I watched / her work bent fingers worry over imaginary / rosaries for three long days.” What was most forbidden, for both the enslaved Irish and the enslaved Africans, was simple human dignity, and this Delgado has explored and restored with compassion, strength, and clarity. Most striking to me is how the chapbook form is being molded to become part of the overall trend of poetry collections that use individual lyric poems to create a narrative arc. While the first books in this trend tended toward personal memoir, the form keeps evolving to cover biography, history, and fiction. The form is so flexible at this point that the narrative arc can stretch through short collection or long, and amores gitano is a great example of how page length is in no way proportionate to the depth of the story or emotional impact. What should you take from this review? Go buy some chapbooks. Take a risk. Thousands are published each year, and if poets don’t buy them, who will? Next up in #poetrylive is the chapbook I bought when I ordered amores gitano, because the title grabbed me. All kinds of interesting things happening there. Follow along to see. 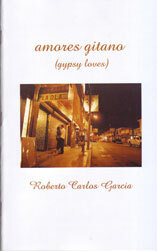 Next up in #poetrylive is Roberto Carlos Garcia’s chapbook amores gitano (gypsy loves) from Červená Barva Press. Truth in advertising – Roberto is a classmate in both the poetry and poetry in translation tracks of the Drew MFA program. But I’d be in love with this collection even if I hadn’t shared the delicious struggling of translation workshops with him! Follow along on twitter, or in the twitter feed on the right. Just finished my re-read of this first collection from Philly writer Jane Cassady. Follow highlights on the right in my twitter-feed. The language here is rich, the images original and yet banging the chord of absolute truth, with tenderness exposed all over the place. I have a particular fondness for the poem below, because I’ve written about these same Germantown mockingbirds mocking the sounds of car alarms. And because #5 made me unable to keep reading until I finished laughing. “If I were a boy…” over her shopping cart. 5. Unitarian cantata on the life of Harriet Tubman. and out from the Regional Rail. comply with the instructions of R&B line dances. “All the Single Ladies” sing along, complete with moves. 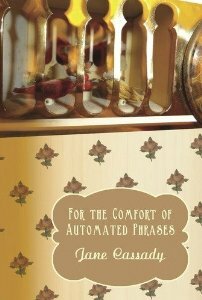 Next book up in my live-tweeting-as-I-read-a-poetry-collection-project is Jane Cassady’s For the Comfort of Automated Phrases, published in 2012 by Sibling Rivalry Press. I read through this book quickly last year, and have been waiting for a time to get back and spend some time with it. So, here I go! Follow along on twitter @ThisFrenzy. Learn how to get your work into the world! If you enjoy my blog, or if the quotations and musings are useful for your own work, please consider donating. Even a buck or two helps to cover the cost of maintaining and expanding the blog.